After installing glass lid, check gap/height adjustments and operation to make sure there is no malfunction. Open sunshade (1), then close glass lid. Remove glass lid bolts (a) on the lh and rh sides. Remove glass lid from moonroof unit assembly. 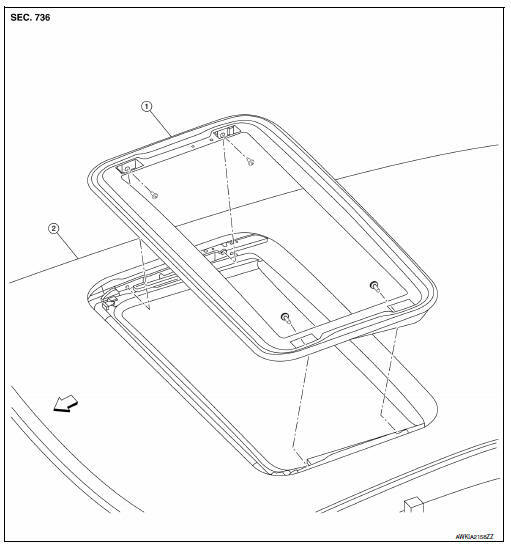 Position glass lid to moonroof unit assembly. After installation, check moonroof operation and glass lid alignment. Refer to RF-40, "Adjustment". Loosen the glass lid bolts. Adjust the clearance of glass lid and roof panel according to the fitting standard dimension. 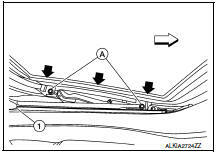 First tighten the front bolt (LH), then the rear bolt (RH) on the moonroof lid assembly to prevent uneven torque while tightening the remaining the remaining bolts. Tilt glass lid up and down several times to check that it moves smoothly. After adjusting the moonroof unit assembly, perform additional service. Refer to RF-18, "ADDITIONAL SERVICE WHEN REPLACING CONTROL UNIT : Special Repair Requirement".